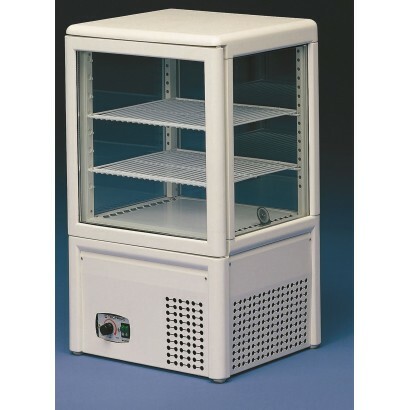 Here at Corr Chilled we offer a great range of cake fridges ideal for the display of cakes and desserts. These cake display fridges give excellent product visibility and are a great display addition to any cafe, shop or restaurant. 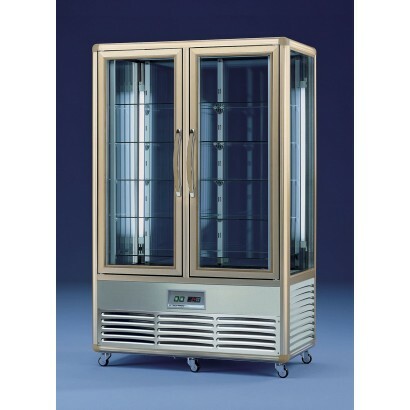 Display your cakes and chilled desserts the right way with our selection of glass door cake fridges. 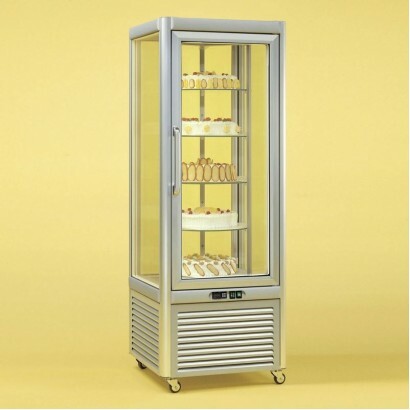 Our cake fridge displays are available in a range of sizes with either glass or wire shelves and with the option of rotating shelves for a rotating cake display to show off the contents to their maximum. For more information about these cake display fridges speak to an expert today on 0161 442 9174. Cake has long been a much-favoured form of dessert. This amalgam of flour, eggs and sugar is well-known for being commonly served at such occasions as birthdays, weddings and anniversaries. Cake can also hugely vary in appearance and ingredients, further extending its appeal. Your own business may sell cake in its bricks and mortar premises. However, to sell more of that cake, you should endeavour to not only set up a cake display, but also make the cake look tasty with that display. This is the case whether you are offering chocolate cakes, butter cakes, sponge cakes, coffee cakes, chiffon cakes, butterfly cakes, or any other form of cake. One risk of placing cake on open display is that you could too easily overlook what conditions are needed for preserving this food's freshness. You don't want to forgo properly looking after your cakes in the effort to bring them to your customers' attention. This helps explain how you can hugely benefit from investing in cake fridges. A cake fridge can assist in creating the optimal storage conditions for cake and, therefore, keeping it fresh, moist and delicious. Furthermore, as we stock cake fridges of various designs, you don't have to struggle to find such a fridge that matches or complements your outlet's overall design. 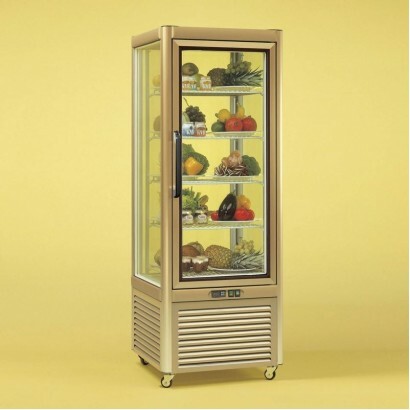 Attractive and elegant, the Polar curved refrigerated display is ideal for merchandising chilled pro.. 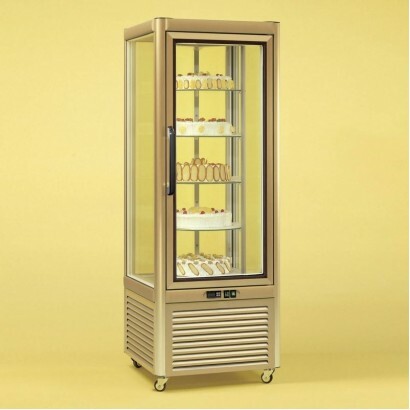 This Tecfrigo Micron Glass Display is perfect for cakes, patisserie items and desserts. It has fan a.. 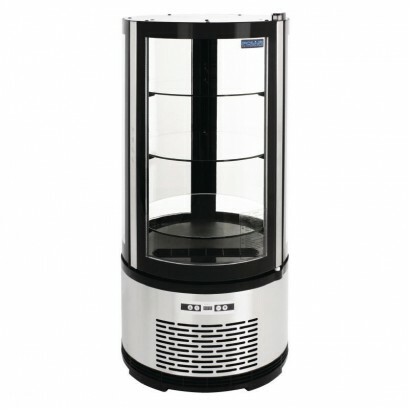 Stylish upright patisserie display cabinet with four glass sides for excellent product visibility. 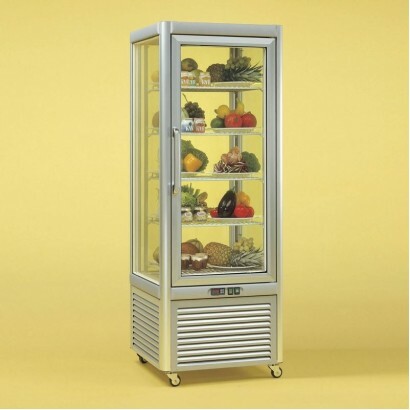 S..
Tecfrigo Goloso rotating cake display with five glass shelves and unbroken curved glass frontage to ..
Stylishly finished single door glass door display fridge. 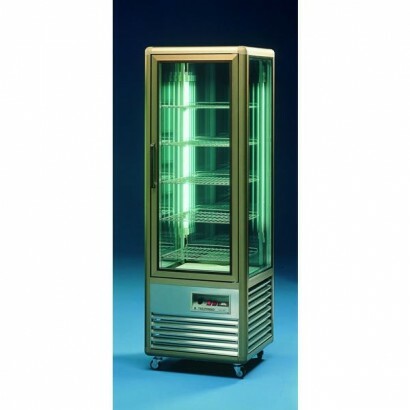 Ideal for use as a cake display, patisseri..
Tecfrigo Prisma cake fridge, finished in gold coloured anodised aluminium. Choose from wire or..
Tecfrigo cake fridge with 3 shelf options, wire, glass or rotating glass. Supplied with 5 shelves as..
Tecfrigo Prisma cake fridge, finished in silver coloured anodised aluminium. Choose from wire or rot..
Tecfrigo Prisma cake fridge, finished in gold coloured anodised aluminium. Choose from wire or rotat.. 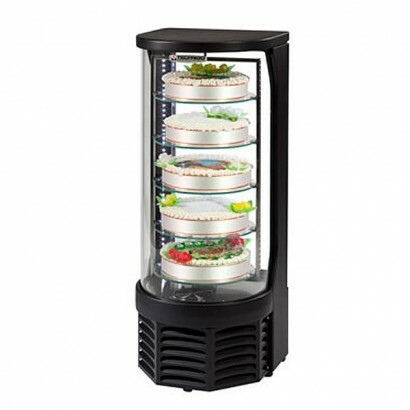 The Tecfrigo Continental 700 range cake display includes some excellent features such as internal il.. 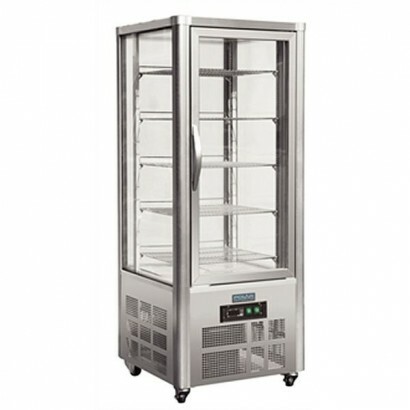 The Tecfrigo Continental 700G range cake display includes some excellent features such as internal i.. This cake display includes adjustable shelving, double glazed glass doors and castors fitted as stan..